MIDEL 7131 has been used for many years in electric freight locomotives, both as the transformer fluid and in some cases as the coolant for the converters. One such use has been by Bombardier Transportation, who have utilised MIDEL filled equipment on rolling stock right back to 1996, starting in their previous incarnation as AdTranz. In July 1998 a very large order was received by the then AdTranz to supply 400 locomotives to DB, designated type BR185. These locomotives were based on the earlier design class 101 which used a MIDEL filled transformer to step down the catenary voltage to a more useful voltage for the onboard induction motors and auxiliary systems. The new locos were to be specifically designed with international operation in mind and as such had to be able to travel through regions with different operating voltages, namely 15kV and 25kV. They were specified as high power units, with a maximum output of 5,600kW and to be capable of being used for both freight and passenger operations. The DB 185 series locomotives were based on what became the Bombardier TRAXX system, a modular approach that allows the locos to operate across borders and on multiple networks. 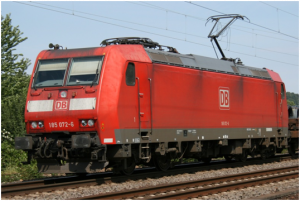 These locos were also known as the TRAXX 140 series when used outside Germany, with a letter designation for whether they were Freight or Passenger configured. The 140 series units have been used all across Europe since successful adoption in Germany, with a total of more than 850 AC type units having been sold. If the TRAXX MS multi system locos, which can also operate on DC networks, are added onto the total then it comes to over 1000, operating with MIDEL filled transformers. An example of the international service of the TRAXX AC system freight locos are those operated by Floyd zRT, used on a corridor that runs all the way through Germany and Austria, on into Hungary. In all the years of operation of the TRAXX locomotives there have been no reported problems with the transformer fluid and the trains have an excellent reliability record, demonstrating that MIDEL gives superb long term service in the most demanding of applications.